In Lewis Carroll’s Through the Looking-Glass and What Alice Found There, the Red Queen tells Alice that “here, you see, it takes all the running you can do, to keep in the same place. If you want to get somewhere else, you must run at least twice as fast as that!” The fast-paced lives of the students and faculty in Dedman College, who travel abroad for study and research, build out startup companies, protect the world from rogue aggression, and engage in taxing endurance sports would exhaust the Red Queen. But it’s all in a day’s work for these students, teachers, and scholars who somehow continually run twice as fast and continually produce ever more surprising and impressive results. In this issue of Inside Dedman College you’ll encounter seismologist Brian Stump, the Albritton Professor of Earth Sciences in the Roy M. Huffington Department of Earth Sciences. Professor Stump monitors shock waves from North Korea to help determine that country’s nuclear capabilities. You’ll also discover the fast-paced lives of SMU students who set up a successful startup company even before graduating with their bachelor’s degrees. BioLum Sciences is the brainchild of Dedman College and Cox School of Business students who put their minds together with Chemistry Professor Alexander Lippert and developed an asthma management system that makes diagnosis, treatment, and monitoring of the condition simpler. Also here to dazzle are students studying and researching abroad; the work of Professor Louis Jacobs, a vertebrate paleontologist after whom a newly discovered dinosaur was named in honor of his contributions to research and teaching in the field; and the experiences of rising—risen!—attorney Jonathan Childers, who was recently named a “Lawyer on the Rise” by Texas Lawyer. Graduate students from Religious Studies and Medical Anthropology will show what it takes to be an Albert Schweitzer Fellow. These full-time graduate students add a service and compassion component to their already full schedules by participating in a program named for the humanitarian-physician Albert Schweitzer. Fellows in this program design and execute projects that improve the lives of the most vulnerable among us and bring much-needed relief to underserved populations in the DFW area. 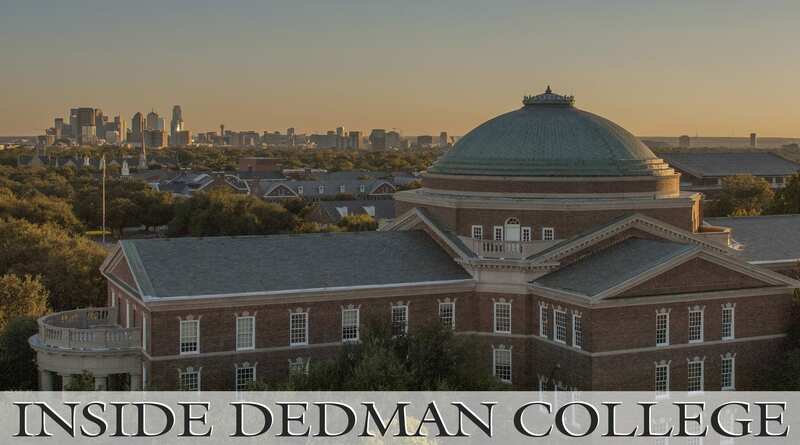 And if you’re not exhausted from reading about the fast-paced lives of the people in Dedman College, we’ll invite you to catch up with us at the Dedman College homecoming tent on November 4, as well as at other events peppered throughout the year.